Sonet QT™ is a noise masking system designed to accomplish two tasks: Sonet is designed to greatly reduce the impact of general noise in the workplace and especially the sound of conversations coming from others in the area. By masking these disruptive sounds, the employee is better able to concentrate on her work as well as enjoying an overall reduction in noise-induced stress. 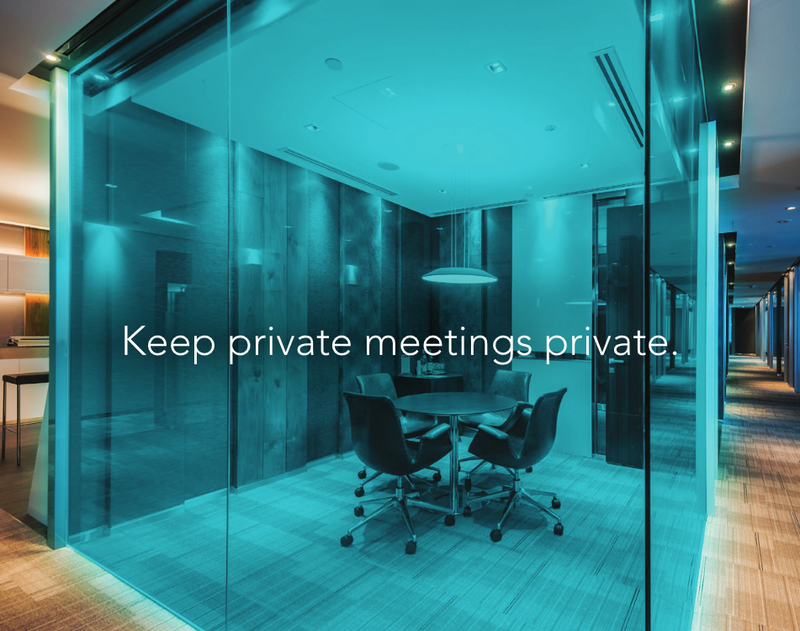 Sonet is also designed to provide speech masking to help protect confidentiality in an office setting by interfering with the occupant's ability to hear and understand conversations that would otherwise be overheard. The Sonet QT™ sound is no ordinary white noise. The patented Sonet QT™ sound is engineered to provide maximum interference with the ability to hear and understand human speech at a given volume level. What this means in practice is that those immersed in a field of sound produced by Sonet will hear much less of surrounding conversations and general office noise, while the Sonet sound disappears into the background. Sonet sound is so unobtrusive that after just a few minutes of immersion in the sound field produced by the emitters, the occupant will become unaware of the sound, just as we tune out the hum of flourescent lights or an HVAC system. Sonet QT™ was originally designed for use in a cubicle space where the two Sonet emitters are installed on the two cube walls so that they project sound directly to both ears, drowning out the sounds coming into the cubicle and enabling the occupant to more easily ignore the surrounding noises and concentrate on his work. The control module should be mounted on the side of the desk or on a cubicle wall where the sound can be easily adjusted by the occupant to address current noise conditions. Sonet can also be used to reduce the distraction of noise coming into an enclosed office. For offices up to 200 square feet in size, one Sonet Base system should be installed. Again, the controller should be placed near the occupant, on a wall or side of a desk, for instance, so that she can readily adjust the volume to suit current noise conditions. The two emitters should be mounted on one wall just above the floor and separated by 6 to 8 feet. The purpose of mounting the emitters low on the wall is to enable them to fill the office with a background sound that is non-directional so that the occupant hears the same level of sound whether seated or standing and no matter which direction she is facing. In this way, the Sonet masking sound will do its job of masking irritating sounds while remaining unobtrusive itself. Sonet QT™ can provide an effective speech privacy system for use in clinics and offices where sensitive conversations occurring in one space can be overheard in adjacent spaces and/or hallways. When used as a speech privacy system, Sonet emitters must be installed in the area where the listener is located rather than in the area where the conversation to be protected is occurring. By filling the ears of the listeners with Sonet sound, they will be less able to hear and understand the words being spoken in the adjacent space. A common application for Sonet is in a suite of offices used by therapists or business managers. Obviously each confidential conversation needs to be protected from overhearing by a client or employee in an adjoining office. In this scenario, a base system should be installed in each office so that no occupant can overhear conversations occurring in the office next door. For offices up to 200 square feet in size, one Sonet Base system should be installed. Again, the controller should be placed near the primary occupant, on a wall or side of a desk, for instance, so that she can readily adjust the volume to suit current conditions. The two emitters should be mounted on one wall just above the floor and separated by 6 to 8 feet. The purpose of mounting the emitters low on the wall is to enable them to fill the office with a background sound that is non-directional so that the occupants hear the same level of sound whether seated or standing and no matter which direction they are facing. In this way, the Sonet masking sound will do its job of masking conversations coming from next door while remaining unobtrusive itself. Another common application for Sonet is to protect confidential conversations occurring in an office, from being overheard by passersby in an adjacent hallway. For installation in a hallway, one controller can drive up to 4 emitters. The controller can be installed inside an office or closet where convenient, and the emitters connected daisy-chain style, down the hallway, approximately 8-10 feet apart and close to the ceiling. In this installation, the goal is to fill the hallway with the Sonet sound preventing passersby from overhearing conversations coming through the doors and walls as they pass. By locating the emitters near the ceiling, the sound will not be projected directly into the ears as people walk by, rather it will fill the space, immersing them in a uniform, non-obtrusive sound masking field that will prevent overheard conversations. Installing emitters near the ceiling in hallways also makes it easier to run the necessary connecting cables without encountering doorways. 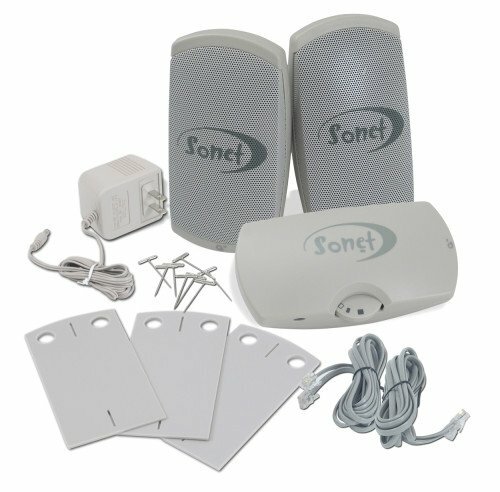 Sonet QT™ is also a terrific sleep machine for use in the bedroom where it will help mask snoring by a sleeping partner as well as noises coming from elsewhere in the building. The sound quality is unparalleled by any ordinary white noise machine. Though not designed for this purpose, the Sonet sound is wonderfully effective at masking snoring, the primary noise that keeps people awake at night. For bedrooms up to 200 square feet, use one base system with two emitters. Install one emitter on each side of the bed near the baseboard and place the control module on the wall or bedside table where it can be reached to adjust the volume as you may choose. The Patented Sonet Sound is engineered to be maximally effective in masking human speech while remaining unobtrusive and non-irritating to those who occupy the space. 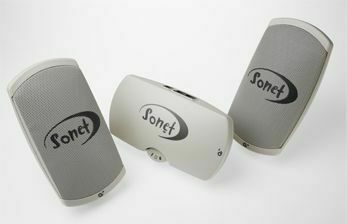 Each Sonet system is composed of a control module and 2-4 specialized speakers called emitters. The Sonet control module is powered by a DC power supply that plugs into a standard electrical outlet. The control module then powers all emitters. All emitters produce the same volume, determined by the volume control setting on the control module to which they are connected. The Sonet control module has a volume control and two ports for attaching emitters using standard telephone connectors. One 12 foot standard 4 wire telephone cable with plugs attached, is included with each emitter, and longer cables can be substituted by users if needed, up to 150 feet long. Sonet is modular and flexible, allowing a variety of connecting scenarios. Two emitters can be independently connected to the controller using the two ports provided, or the first emitter can be connected to the controller and the next emitter connected to the first, and so on, daisy-chain style, up to 4 emitters on each control module. Emitters and the control module are about 6 inches tall by 4 inches wide by three inches thick and are mounted using the included adhesive/velcro system, or for soft sided cubicles, with a pin and velcro system, also included. All components are connected by wire so a plastic wire molding is often used to hide wires connecting components (not included). Extension kit which lets you expand your existing base system by adding two more emitters.